Before I learned about Aquamira Water Treatment from my buddy Jason, I used a filter made by MSR to purify water in the backcountry. At 16oz, it is more lightweight than many filters on the market. It even comes apart with minimal effort, which makes it easy to clean when it clogs. If you have ever backpacked through southern Utah’s canyons, you know how important this can be. Nonworking filters are commonplace in this type of environment. Some of the tadpole and algae filled pools you are forced to drink from in the desert are a bad case of giardia waiting to happen. When it comes to filthy, stinky, or silty water I still think a filter is a must, but what about places where the water is crystal clear? In the mountains, a bumbling brook can seem safe to drink without treatment, but the experts warn that you can get sick from these water sources. That is where Aquamira becomes my go-to for water treatment. Aquamira comes in two forms: Liquid drops and tablets. Either one works, but I seem to keep coming back to the liquid drops. They come packaged in mini droppers and weigh just 1oz. Aquamira weighs less than a filter. – 1oz vs. 16oz can make a huge difference when you are backpacking. Aquamira takes less time than a filter. – Filters can take a long time. 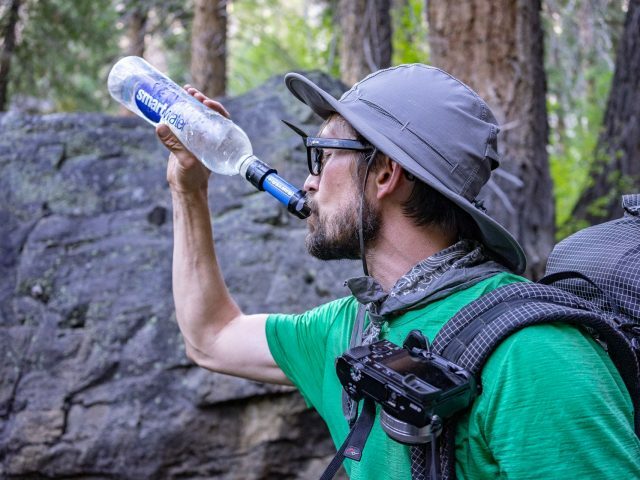 With Aquamira, you dip your bottle in the water until it fills, add drops and get back to hiking. You do have to wait 30min before it is safe to drink, but you can use that time do other stuff! In some instances, lake water can be filled with bugs, gunk, and tiny particles you do not want to drink. My friend Clay taught me an excellent solution for this problem. Cover the top of your water bottle with pantyhose. Pantyhose are just porous enough to let the fresh water in and keep the unwanted debris out. One last thing: Some people use iodine as an alternative to Aquamira, but in my opinion, it is not as good. Although you can drink iodine-treated water right away, it has a noticeable and awful flavor along with a urine-like color. This can ruin the enjoyment of an otherwise delightful experience. There is nothing quite like thirst quenched from a pristine water source in nature. I realize some filters are 16 oz, and maybe that is because you need one with a hose and pump for sourcing water from extremely shallow spots, but why not use Sawyer Squeeze? It’s under 3 oz and removes 99.9999% of Giardia and Cryptosporidium and the like. They only cost $29 and will treat up to 10,000 gal of water. Just my 2 cents. You’re right, at 3.7 oz, the Sawyer Squeeze is an excellent, lightweight option for backpackers that want to use a gravity filter. These days, I prefer to use Aquamira, Aquatabs, or Katadyn tablets. They are lighter than a filter while still killing most bugs. The convenience of filling up, adding a tablet, then continuing to hike while you wait 30 min to drink is unbeatable. Of course, you will get floaters if you don’t strain through pantyhose. I am at a point where floaters and small debris don’t bother me though. Hi, we're Max and Kim. Thanks for visiting. We're a married couple with a passion for the great outdoors. Click on our photo to learn more and if you want to write us please do. We'd love to hear from you! You can support our work for FREE. Before shopping (at no additional cost to you), click one of the links below. Thanks for your support! Sign up below for new hiking guides, trip reports, gear reviews, and more. We are currently working and playing out of Tucson, AZ. We love it so far! The people are friendly, the food is excellent, and the surrounding Sonoran Desert is full of beauty. This website participates in affiliate marketing. When you click a link and make a purchase, a small portion of the sale helps support the blog. We value your privacy and do not share your personal information. © 2019 Back o' Beyond. All rights reserved.